Carbon nanotubes are an emerging material that has had increasing industrial application in material reinforcement and great future potential in electronics, energy storage and conversion, and medicine1-4. The economic impact of carbon nanotubes has been estimated at $2.7 billion by 20155. Discovered less than 25 years ago, carbon nanotubes are cylindrical, quasione dimensional structures of one (single-walled carbon nanotubes, SWCNT) or more (multi-walled carbon nanotubes, MWCNT) rolled-up sheets of grapheme. Carbon nanotubes have inner diameters from 0.7–2nm and can have average lengths of several microns, depending on the method of preparation. Comprised solely of sp2 carbon, carbon nanotubes are strongly hydrophobic. They are very difficult to disperse in aqueous solutions as individual nanotubes; aggregation instantly occurs without amphiphilic surfactants present to fully coat the surface of the nanotubes. Carbon nanotubes, specifically SWCNT and DWCNT (double-walled carbon nanotubes), have several unique optical proper ties that can only be exploited in solution including a strong Raman graphitic ‘G’ band peak at 1600 cm-1 and fluorescence with excitation and emission in the Near-Infrared region—both of which have been exploited for biomedical imaging and biosensing4,6. Characterisation of the SWCNTs and DWCNTs and their surfactant coating is important in solution to understand the stability and aggregation of the constructs. Several common characterisation methods which are used for such measurements include dynamic light scattering, zeta potential, and analytical ultracentrifugation7. In this report, we demonstrated the use of the DelsaMax PRO to measure the size and stability of SWCNTs/ DWCNTs in aqueous solutions as a function of temperature. The SWCNTs/DWCNTs were dispersed in 2% Sodium Dodecyl Sulfate or 2% Sodium Cholate, which are common surfactants used to separate individual SWCNTs8,9. With the DelsaMax PRO, the zeta potential and hydrodynamic radius of SWCNT and DWCNT solutions were measured reliably and repeatedly in less than 1 minute with low volumes. The powerful DelsaMax analysis software allowed us to rapidly display and analyse the mobility data, correlation data, and regularisation data in real-time so that the quality of the measurement could be quickly assessed, and the measurement could be stopped or rerun in the case of a dust event. In 20 mL glass scintillation vials, 10 mL of water was added to 200 mg of either Sodium Dodecyl Sulfate (SDS, Sigma Aldrich) or Sodium Cholate (SC, Sigma Aldrich). Two mg of either SWCNT (Sigma Aldrich) or DWCNT (Sigma Aldrich) were weighed and added to the vials as well. In all, four different solutions were made (SDS + SWCNT, SDS + DWCNT, SC + SWCNT, SC + DWCNT). Each vial was bath sonicated for 10 minutes to disperse the nanotubes. Each solution was then transferred to a 15 mL conical tube and centrifuged at 3000 rpm (1855 g average rcf ), Acceleration=Max, Deceleration=Max, at 20° C for 5 minutes with a JS-4.2 rotor in a Beckman J-6B centrifuge (equivalent to J6-MI from Beckman Coulter). Centrifugation pelleted aggregated and poorly coated nanotubes, while well-coated, individual nanotubes remained in the supernatant10. The concentration of nanotubes in solution was 5.8 mg/L for all measurements. The mass concentration of the carbon nanotube solutions was determined by UV-Vis-NIR absorption spectroscopy (Figure 1), using the mass extinction coefficient for SWCNT at 808 nm of 46.5 L/g*cm11. The mass extinction coefficient for DWCNT is unknown at this wavelength but it should besimilar. Fur ther confirmation of the mass normalisation of the nanotubes was indicated by roughly the same absorption at 400 nm. This region is devoid of surfactant absorption as well as Van Hove peaks of absorption of the SWNTs12. All spectroscopy measurements were per formed with a 1 cm quartz cuvette using a Beckman Coulter DU 800 Spectrophotometer. The DelsaMax PRO was used to analyze the size and stability of the carbon nanotubes solutions using, respectively, Dynamic Light Scattering (DLS) and Phase Analysis Light Scattering (PALS). Briefly, after connecting the flow cell to the DelsaMax PRO and turning on the instrument (allowing 30 minutes for the laser to warm up and equilibrate), the flow cell was flushed with 3 mL of deionized, 20 μm filtered water. Following this, ~300 μl of each nanotube solution was injected with a 1 mL syringe through the injection port. After a few seconds, the instrument was in equilibrium, demonstrated by a smooth correlation curve on the on-instrument display. The temperature was set to 20° C with a 1° C/minute temperature ramp rate. At this time, simultaneous DLS and PALS measurements were made— 5 acquisitions at 10 seconds/acquisition were taken to determine the DLS, while PALS was collected for 15 seconds at 2 V and a 10 Hz alternating electric field. The absence of dust or any other outlier event was determined by looking at the mobility curves for each of the 31 PALS detectors and the individual correlation curves for each DLS acquisition. PALS data was reported as zeta potential for each solution. After collecting size and zeta potential measurements at 20° C, the DelsaMax PRO was ramped up to 30° C and the size and zeta potential were re-collected. This procedure continued at 40° C and 50° C for each nanotube-surfactant solution (Figure 2). Figure 1. UV-Vis-NIR absorption spectrum of the nanotube solutions. Nanotube solutions were scanned from 250 nm to 900 nm and normalised to the same absorption at 808 nm. Note the peaks of each SWCNT dispersion are due to Van Hove singularities, a property of linear crystals1,13. Metallic SWCNTs (1/3 of bulk SWCNTs) have Van Hove singularities from ~400–550 nm, while semiconducting SWCNTs (2/3 of bulk SWCNTs) have Van Hove singularities from 550 nm to beyond 1 micron. DWCNT lack discernible Van Hove singularities; the reader is directed to the review by Shen et. al. for a detailed reasoning for this phenomena14. At 2% w/v, both SDS and SC were able to make stable solutions of SWCNT and DWCNT as determined by zeta potential (Figure 2c & 2d). A zeta potential with absolute value greater than 30 mV is generally considered to be stable; at all temperatures, the nanotube-surfactant solutions had zeta potentials with absolute magnitude greater than 40 mV. As temperature increased, the hydrodynamic radius of the nanotube-surfactant constructs increased (Figure 2a & 2b). This interesting result indicates that, most likely, the hydrophilic portion of the surfactant coating expanded out from the nanotube surface into solution. This conclusion is reached because the nanotubes were not changing in size with temperature and the hydrophobic portion of the surfactants was bound to the surface of the nanotubes. Furthermore, if aggregation occurred for the nanotubes at higher temperatures, it would cause both a much larger than observed increase in nanotube size through the cumulants method of analysis, a corresponding decrease in nanotube stability indicated by the zeta potential approaching 0 mV (as the aggregates would begin to dominate the mobility signal), and a rapid rise in polydispersity. Finally, using the regularisation method of analysis, larger peaks in the micron region would begin to emerge at increasingly higher intensities if aggregation occurred. None of these indicators were observed for any sample. 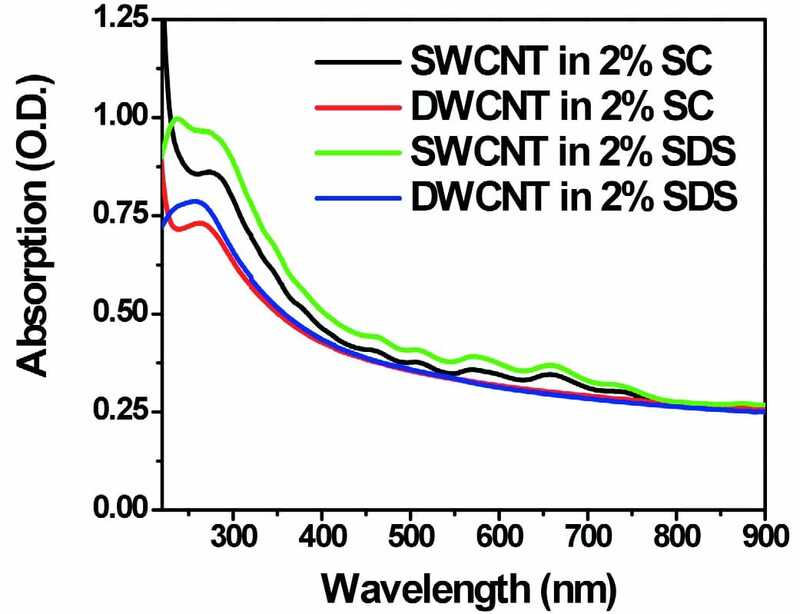 In all cases, DWCNT were larger in radius than SWCNT due to the larger diameter; the lengths of the SWCNT and DWCNT should be similar in both SC and SDS after sonication and centrifugation, while zeta potential measurements showed a stable solution in all cases, indicating that the nanotubes were individually dispersed and not aggregating. Characterising nanoparticles in solution is crucial if the intended application requires them to be in solution. While electron microscopy and atomic force microscopy can give detailed information on shape and size, they require that nanoparticles be deposited on a substrate, which can confound the data. More impor tantly, only a small sample size of the nanoparticles can be thoroughly analysed, which can lead to a disrepresentation of the overall sample and is a long and tedious process. The DelsaMax PRO —with dual, simultaneous DLS and zeta potential—can accurately and quickly size a solution of nanoparticles and determine the stability. By per forming both measurements in one, low-volume flow cell (minimum volume of 140 μl and 1.6 mm spacing between electrodes), the solution under examination does not need to be transferred, which is a source of dust that can greatly affect the precision of the measurements. Despite a researcher’s best efforts, sometimes dust or other small contaminants are included in the sample. With the DelsaMax PRO software, these outlying dust events are easily identified and can be removed by deselecting individual acquisitions (for DLS) or detectors (for zeta potential). Most importantly, the true benefit of the simultaneous measurement is speed; by collecting both zeta potential and the size within seconds, the probability of a dust event is greatly reduced compared with typical size and zeta potential measurements that take at least several minutes. The speed of the instrument can directly save a researcher time by getting the data quickly; indirectly, the time saved by minimising the issue of dust contaminants may be many times greater. Figure 2. Dynamic Light Scattering and Zeta Potential. Hydrodynamic radius for SWCNT and DWCNT in (a) 2% Sodium Cholate and (b) 2% Sodium Dodecyl Sulfate were determined using the DelsaMax PRO. The hydrodynamic radius is the average of 10 acquisitions, while the error bar corresponds to the standard deviation of the radius for the 10 acquisitions. Zeta potential of SWCNT and DWCNT in (c) 2% Sodium Cholate and (d) 2% Sodium Dodecyl Sulfate did not have any observed correlation with solution temperature; at all temperatures, the nanotube-surfactant constructs were stable. 1. Jorio A, Dresselhaus M S and Dresselhaus G; Carbon Nanotubes: Advanced Topics in the Synthesis, Structure, Properties and Applications—Springer Laboratory: (2008). 2. Avouris P and Martel R; Progress in Carbon Nanotube Electronics and Photonics—MRS Bulletin. 35; 306-313: (2010). 3. Baughman R H, Zakhidov A A and de Heer W A; Carbon nanotubes: the route toward applications—Science. 297; 787-792: (2002). 4. Liu Z, Robinson J T, Tabakman S M, Yang K and Dai H; Carbon materials for drug delivery & cancer therapy—Materials Today. 14; 316: (2011). 5. ION Publishing Ltd.; The Global Market for Carbon Nanotubes: A Realistic Market Assessment—2nd Edition: (2010). 6. Liu Z, Tabakman S, Welsher K and Dai H; Carbon nanotubes in biology and medicine: In vitro and in vivo detection, imaging and drug delivery—Nano Research. 2; 85: (2009). 7. Maechtle W and Borger L; Analytical Ultracentrifugation of Polymers and Nanoparticles—Springer Laboratory: (2006). 8. Green A A and Hersam M C; Nearly Single-Chirality Single-Walled Carbon Nanotubes Produced via Orthogonal Iterative Density Gradient Ultracentrifugation—Advanced Materials. 23; 2185: (2011). 9. Wenseleers W, Vlasov I I, Goovaerts E, Obraztsova E D, Lobach A S and Bouwen A; Efficient Isolation and Solubilisation of Pristine Single-Walled Nanotubes in Bile Salt Micelles—Advanced Functional Materials. 14; 1105: (2004). 10. Welsher K, Liu Z, Sherlock S P, Robinson J T, Chen Z, Daranciang D and Dai H; A route to brightly fluorescent carbon nanotubes for near-infrared imaging in mice—Nat Nano. 4; 773: (2009). 11. Robinson J T, Welsher K, Tabakman S M, Sherlock S P, Wang H L, Luong R and Dai H J; High Performance In Vivo NearIR (> 1 μm) Imaging and Photothermal Cancer Therapy with Carbon Nanotubes—Nano Research. 3; 779-793: (2010). 12. Diao S, Hong G, Robinson J T, Jiao L, Antaris A L, Wu J Z, Choi C L and Dai H; Chirality Enriched (12,1) and (11,3) Single Walled Carbon Nanotubes for Biological Imaging—Journal of the American Chemical Society. 134; 16971: (2012). 13. Van Hove L; The Occurrence of Singularities in the Elastic Frequency Distribution of a Crystal—Physical Review. 89; 1189: (1953). 14. Shen C, Brozena A H and Wang Y; Double-walled carbon nanotubes: Challenges and opportunities—Nanoscale. 3; 503: (2010).